"Dan Patrick Show's" McLovin Eats Stranger's Food After Spinning the "Wheel of Punishment"
The Dan Patrick Show is a nationally simulcasted radio show that also appears on NBC Sports Network and Audience Channel on DirecTV. With the television element included in the radio show, Dan and his "Danettes" like to have a little fun during the show. One part of the show is the "Wheel of Punishment." There have been some great punishments in the past for bets or predictions gone wrong. From body paint to getting into the octagon with Fox Sports' Jay Glazer, each Danette has suffered the wheel of punishment. On Monday's show, Andrew "McLovin" Perloff had to spin the wheel after making a prediction about Alex Smith and the Chiefs that fell flat. Eat a stranger's food off their plate is one of the more unique ones any Danette has faced. But McLovin made good and completed his punishment, and it was all caught on hidden camera. Deadspin released the graphic photos of Cowboys defensive end Greg Hardy's ex-girlfriend's bruises which he allegedly inflicted on her. For legal reasons, you have to say allegedly, but we all know he did it. While Jerry Jones and the Cowboys continue to pretend like the incident wasn't a big deal and keep reiterating the "second chance" rhetoric, Hardy finally addressed the photos and the incident that got him in legal trouble because, well, there's damning evidence out there now. And no. He didn't address it with the media. Let's all remember the constant "No comment. Next question" response after his altercation with the Cowboys special teams coach. Instead, he took the cowardly approach and did it on Twitter. If Hardy was any average Joe and wasn't a professional athlete, he would be sitting in jail for what he did. Instead, Hardy was able to pay off Nicole Holder, had the case dismissed and last week, had the case erased from this record. Also, did Hardy make his profile name and twitter handle that so we couldn't find him? Like Katie Nolan said on her FS1 show "Garbage Time," Hardy is a "garbage human". Another week, another game decided by a controversial call. This week, our controversial play happened in Lincoln, Nebraska. No. 7 Michigan State let 3-6 Nebraska hang around and this touchdown pass decided the game. As you will see, Nebraska wide receiver Brandon Reilly went out of bounds on the near sideline, came back in and made the catch for a touchdown, giving the Huskers a 39-38 lead and eventual win. The officials called it a touchdown and said that Reilly was forced out of bounds by the Michigan State defender. The call doesn't compare to Miami's miracle return against Duke that should have never happened. The ACC suspended that crew and the replay officials for two weeks for four mistakes they did not catch on the play. The loss is Michigan State's first and it also keeps lowly Nebraska's bleak chance of becoming bowl eligible alive. The Big Ten may address the issue, but in regards to a punishment like the ACC officials received for their blunder in Durham, don't expect anyone from that Big Ten crew to be suspended. Larry David Returned to Play Bernie Sanders on "Saturday Night Live"
Presidential candidate (crazy that we're still referring to him as that) Donald Trump hosted "Saturday Night Live" this weekend. While Trump was the main attraction as the host, Larry David returned to the show to play another presidential candidate, Bernie Sanders, for a cold open. Again, David was a riot. As Sanders, he said he only crosses bridges by kayak due to America's crumbling infrastructure and that he accepts vacuum pennies as campaign contributions. Also, his crush is every black person in America, apparently. Larry David also appeared as himself during Trump's monologue, and did a little heckling. Take a look. React, overreact, fight over them with your buddies. 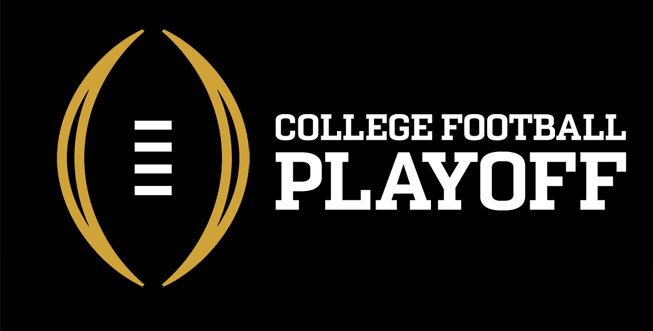 It's the first top 25 from the College Football Playoff committee. Keep in mind, last year's champion Ohio State was No. 16 in the first poll and three of the top four teams (Mississippi State, Auburn, Ole Miss) did not make the playoff when it was all said and done. And if you haven't seen it yet, Jimmy Kimmel and other celebrities and athletes remind you through a rendition of "Auld Lange Syne" that the College Football Playoff is on New Year's Eve this season. Plan accordingly. On Monday afternoon, Presidential candidate Donald Trump appeared on Colin Cowherd's radio show "The Herd" on FS1 and on iHeart Radio. FS1 decided to re-air the interview in primetime. If you loathe both men, you probably though "Oh, great. Two big mouths who have opinions on Hispanics". Even if you don't like Trump, the interview was good, and yes, there were some standard "Trumpisms" you've heard since he decided to run. Cowherd asked some good questions. He asked him about his decision to run, the coverage he has received, his opponents in the run for the G.O.P. 's nomination and gave us some interesting soundbites. He sees himself as the "Tom Brady of negotiators" and shared his thoughts on the Patriots quarterback. Trump believes he will could win the majority of Hispanic votes if he wins the candidacy and he threw in that he was late for a speech because he was watching "The Herd" one afternoon. When asked which sports team he would like to own, he gave an obvious answer. Just when Nationals fans thought Bud Black was the teams new manager, the team pulled a 180 as talks fell apart with Black. Instead, they went to the second choice on their wish list: Dusty Baker. Washington announced that they hired the 66 year-old Baker on Tuesday to a multi-year deal. One of the big reasons for the falling out with Black was money. The Nationals tend to cheap out on managers with short-term contracts, usually offering two-year deals with options, but not much money. The original offer to Black was said to be a one year, $1.6 million dollar deal. Keep in mind, the Nationals have a $165 million payroll and an owner who is one of the 100 richest people in the world. The Kansas City Royals were a resilient bunch throughout the postseason. They proved it again on Sunday night, as they rallied from 2-0 down to force extra innings and scored five runs in the top of the 12th to beat the Mets 7-2 and win their first World Series title since 1985. New York's Matt Harvey pitched eight strong innings, and came back out for the top of the ninth. After walking Larenzo Cain to start the inning, Cain stole second. Eric Hosmer followed that with a double to bring Cain home to cut the Mets lead in half. Collins then pulled Harvey and brought in Jeurys Familia to try and close it out. Moustakas grounded out to first base for the first out, advancing Hosmer to third. Salvador Perez came up and grounded out to first, and Hosmer gambled and went home. An errant throw by Lucas Duda to home plate was off the mark as Hosmer scored, tying the game 2-2. The Mets went in order in the bottom of the ninth, and it moved into extras. In the top of the 12th, Perez reached on a leadoff single. Jarrod Dyson came in to run for Perez. He stole second, putting himself in scoring position with Christian Colon pinch-hitting for pitcher Luke Hochevar, Colon singled to left, scoring Dyson, as the Royals went up 3-2. Following that, the floodgates opened for Kansas City. An error by Mets second baseman Daniel Murphy out two runners on for the Royals. Alcides Escobar hit a double to left field, scoring Colon to make it 4-2. After intentionally walking Ben Zobrist to load the bases in an effort to set up a double play, Lorenzo Cain ripped a double deep to center, clearing the bases to put Kansas City up 7-2. The World Series title is the second in Kansas City Royals history. The first one came back in 1985, when they beat their cross-state neighbor, the St. Louis Cardinals, in seven games. Salvador Perez was named the World Series MVP. The Steelers lost to the Bengals on Sunday 16-10. With a result like this comes the knee-jerk reactions from the fanbase, and where do most of the crazy fans go to express their frustration? The teams Facebook page. That's right. Why wait on hold during the postgame radio show when you can vent your anger and poor grammar quicker on social media. Mikey and Big Bob, hosts of the Kiss Morning Freak Show on 96.1 Kiss in Pittsburgh have made a segment out of reading Facebook comments fans post following Steelers, Penguins and Pirates games. Earlier Monday, they sifted through all the comments on the Steelers Facebook page, and read some of the best (by best I mean ridiculous) ones. Another great example of why you should proofread your tweets. Especially if you manage the account of a major sports network. Sportsnet in Canada was ready to tweet out that the New York Mets finished off the Royals and forced Game 6 back in Kansas City. Well, the Royals got a run across the plate in the top of the ninth to tie the game and force extra innings. As of 11:42pm ET, the game is still happening in the bottom of the 11th. Even with Kansas City tying it, Sportsnet tweeted that anyway. They deleted it after realizing their mistake, but Deadspin got a screenshot of it. Don't feel too bad, Sportsnet. Fox Sports was already promoting a Royals-Mets World Series before Kansas City finished off the Toronto Blue Jays in the ALCS.